This is a HOT class! Learn a method of glass working by way of using a kiln. 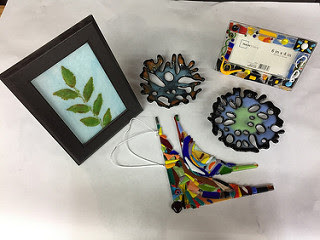 In this (3) consecutive week class, you will be introduced to using creating functional art pieces with compatible glass. 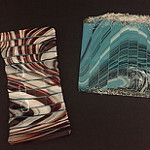 You will be creating a project each week with processes of heat and glass to work together. You will learn about firing schedules, tools and ideas to create your projects. Required Skills: NO previous kiln forming. No experience in any glass work required, come have some fun to create and try fusing with a 4 - sided panel lantern in kiln formed glass. This is a mosaic project based kiln forming workshop. Students are advised to have their own mosaic wheeled nipper, but not a requirement as some are supplied in the classroom during class time to complete the project. This is also just in time for an idea for Mother's Day idea and or right on time for spring patio decorating. Class fee includes: All materials and a white lantern. Required Skills: Fusing, Slumping experience is advised, but not required. You will create 5 projects in 4 weeks in this fun ideas fusing class This is not the same project class as before of 5 in 5, these are all NEW projects. Projects include jewelry pendants with hints of dichro and fusible glass image decals for unique and one of a kind pendants, a sand dollar shallow bowl with powder frit, a hanging fused mosaic fish, a fused mosaic picture frame and a whole new concept called 'fossil vitra'. Class fee includes: The frames for the fossil vitra, as well as, the picture frame, all glass and materials for other projects. Students are required to have: Necklace cords for the assortment of pendants that you create. The process involves allowing molten fusible glass to flow through the hole in a clay type pot onto fiber paper or onto a base piece of glass that is on your kiln shelf. This requires excessive high temperatures and as the temperatures of the glass rises and becomes liquid, it flows like hot candle wax out of the opening bottom of the pot. This technique is a great way to use up fusible scrap and miscellaneous bits of fusible glass. The resulting melt can be presented as-is flat or incorporated into other projects or slumped into a functional art piece. As per kiln space for all students, student class pot melts as a specific size, we will supply you with a formula for calculating the wanted size of a pot melt for future melt making in your own studio. We will be using System 96 compatible fusible glass. Sometimes pot melts require and/or you would prefer to cold work them a little bit, so use of our machinery needs to be expected for your projects during class time. Class is 1 night a week for 3 weeks. You will be creating 2 Melts. , you need to plan on bringing your own 96 coe fusible scrap glass for your 2nd melt. Class fee includes: Glass for 1 melt. Students are required to have: Your own 96 coe fusible scrap glass for your 2nd melt. 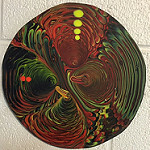 Required Skills: Must have fusing experience and/or have completed the beginning Fusing class. 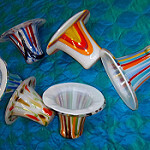 Students will create (2) vases by way of what is called the 'drop ring' and or 'sagging' the glass through an opening'. One vase will be made in clear and transparent glasses and one in opaque. Students will accessorize and/or style vases with sheet glass, confetti, frits, stringers and pebbles This technique requires cold working aspects by way of the use of saws, sand blasting and the sanders. You must supply your own basic cutting tools. Class fee includes: All glass, supplies and materials are included in the class fee. Students are required to have: Basic glass cutting tools. Required Skills: Fusing and glass cutting experience required. An advanced fusing technique. Students will learn the art of combing and raking a mix of molten glass at an utmost ‘hot’ temperature. Students will learn to use hot glass tools and safety equipment for manipulating glass at an excessive temperature. Class is (1) night a week for 3 weeks. Cold working techniques will also be covered in this hands-on class. You will be cutting many strips of glass. You will create (1) combing and incorporate it into a finished masterpiece that may be left flat or you may choose to have it slumped. Class fee includes: Use of the combing tool and all System 96 Fusible Compatible glass will be supplied to complete your class masterpiece. Students are required to have: Basic Glass cutting tools. Option of purchasing fusible 96 glass in color of your choice if you desire a color for your art piece that is not offered in the class selection. 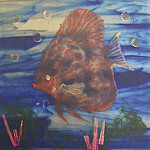 Required Skills: Must have fusing experience and/or have completed the beginning Fusing and Slumping class. Another advanced fusing technique. A pattern bar is a thick bundle of glass that has been fused together to form a sold mass and or a solid block. Once fused and cooled, you will slice it with the saw and then the inside of the block hence the sliced pieces are laid flat and becomes your kaleidoscope design. You will decide how you want to incorporate your pattern bars into finished art pieces. Class is one night a week for 5 weeks. You will be required to use saws and cold working equipment. You will each create (4) styles of pattern bars. Class fee includes: All glass for your bars is included in the class fee. Students are required to have: System 96 fusible glass (purchased from Western Art Glass) for your final projects. Required Skills: Cutting and Fusing experience required. At times we have a special assortment of what is called 'Fuser's Reserve' Glass. It is an intriguing work of it's own design. You will select your own sheet from the assortment. This workshop is about cutting it up into strips and re-arranging the already 'cool' pattern into a new twist and creating your own one-of-a-kind project. You will decide your own rendition and finished shape/size of (1) Fuser's Reserve creation. Left flat or kiln fired again to shape into a bowl or plate, YOU Decide. This is a perfect creative idea to complete with some sweet treats for your special someone! You will need to cut your own strips to create your project and understand the basics of the kiln firing process. Students will need to return at a later date to pick up project after it has undergone the kiln firing process. *Max project size is 12 x 12 as per the size of the fuser's reserve glass. 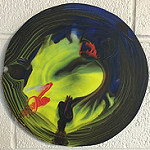 Class fee includes: ALL GLASS + 2 kiln firings if need be for this project. Students are required to have: Glass cutting tools. Required Skills: Fusing & Glass Cutting experience is required. This truly a very HOT class. 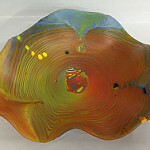 This technique in the kiln-formed fusing category entails you to truly work the glass inside the kiln at a high temperature while also following utmost safety guidelines, protective clothing and of course assistance. You have to work inside the kiln as the glass has to become excessively HOT in order to manipulate the molten glass. Besides working in the kiln, you will also need to plan to use the saw and sanders for cold-working after the glass has cooled to room temperature. If you have taken the original 'Combing' class, that is a great foundation, as this is not the same class. Combing yes, but a different spin on another version of the technique. Each of your will be creating a combing in your choice from a selection of certain sizes and perimeters as well as how comfortable you feel with working hot. Some of you will be working in the bigger kilns and some may prefer to work small. YOU will choose what you feel comfortable with. You will design your own idea for the combing. You may leave your combing as a flat tile or if you want to create into a slumped project and need additional glass. Class fee includes: Glass for the actual combing an kiln firings to complete (1) combing project. 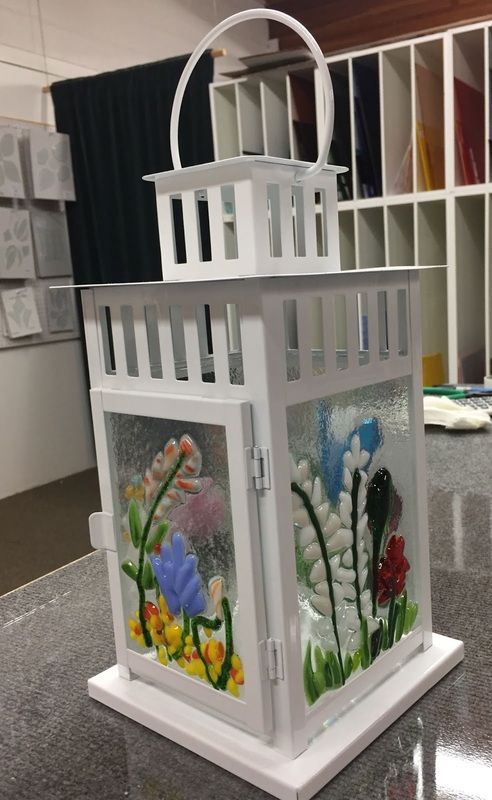 Students are required to have: You will need to purchase the additional fusible glass from Western Art Glass as no other glass is allowed in our kilns. 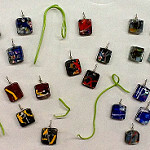 Required Skills: Previous Fusing Experience and/or completion of the Beginning Fusing and Slumping class is required. This is a class expanding on the use of frits and powders to create 'wafer-thin' components that you will pre-fuse so you can then use with fused glass projects at later times. There are two ways of making powder wafers. 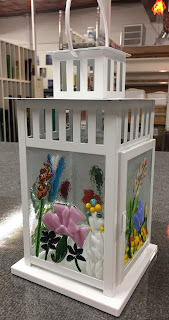 The advantage of creating these pre-fired components is that you can play around with the placement of the wafers or images as you assemble and or create your full fused project, you can overlap them on each-other and or add other fusible glass, stringers and confetti and even paint to embelish them. Class is one night a week for 4 weeks. You will make several wafers and you will design your own project. **This is one of many ways of using powders and frits. We also have another frits and powders technique class tentatively scheduled on the horizon. Class fee includes: All Materials to create the wafers. Students are required to have: You must purchase the base glass to complete your wafers into a finished and final project. Required Skills: Fusing and glass cutting experience. Whereas the traditional fusing method of assembling a design from pieces of flat glass that are cut to a specific size and shape and kiln formed, the strip cut construction method takes on quite a different approach. 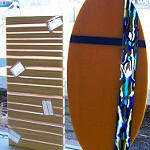 Strips of glass at least 3/8” will be side-stacked on edge, dammed and fired. 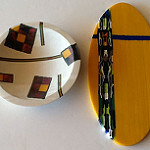 Due to the side-stacking of the glass, the finished piece of fused glass is generally bubble-free. It is possible to achieve very precise graphic designs in your work by varying the colors and the arrangement of the strips. You will learn how to incorporate ‘windows’ and or design elements into your project. The finished piece will be thick and requires some cold-working with the tile saw and sanders. You will be cutting an extensive amount of glass strips. Students are required to have: Basic glass cutting tools and desired finished color glass for the final project. Required Skills: Fusing, Slumping experience is helpful, but not required. 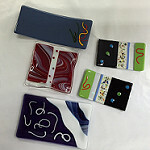 This is an introductory course in a very popular and fun technique in the hot glass category. 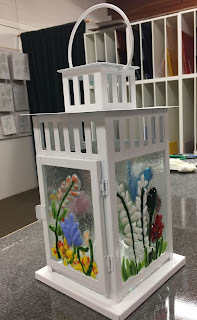 This technique uses frit powder and (1) piece of fusible sheet glass. Class is 1 night a week for 3 weeks. Three techniques will be demonstrated in this introductory course and each student will choose which technique to use to make their 3 projects. Each project will also be slumped into a mold selected by the student. Class fee includes: All materials and additional tools needed for this technique. Learn to take your fused glass jewelry to the next level. This class will focus on creating thick jewelry with system 96 coe glass. You will make a thick tile that you will slice into rectangles and squares and then you will cold work and polish these thick glass cubes into awesome pendants, earrings and rings. You will make several finished pieces. You will be required to work with saws and a wet belt sander. Class is (1) night a week for 3 weeks. Class fee includes: All materials and fittings to complete your jewelry. 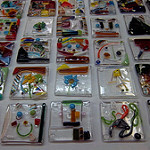 Required Skills: Glass Fusing & Cutting Experience is required. 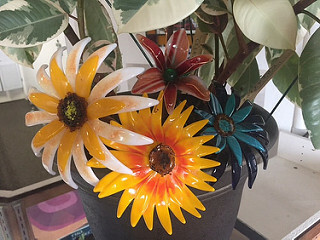 Learn to create glass flowers in the kiln with the use of draping or slumping molds specifically for making kiln formed flowers. You will create 3 up to 4 flowers in this 4 week class. With help, you will be drilling the hole into each of your flowers to accommodate the hardware for the flower(s) to freely stand on a surface; use as a stem to anchor into a pot of dirt or your own actual flowerbed. Flowers are able to be inside or out, but should be brought in for winter. Class fee includes: All materials and hardware to create your flowers. While in college, my summer job at the local stained glass shop would ulitmately take me on an incredible and rewarding journey. Glass has a power of magnetism. It draws me into a world of peace and tranquility with it’s transparency as well as opacity, it’s form and function. I am intrigued with the possibilites of what glass has to offer in all respects of application and use. This has led to me to study with some of the best and world renowned glass masters. I am honored to learn their techniques and to adapt them into my own transitions and perspectives. 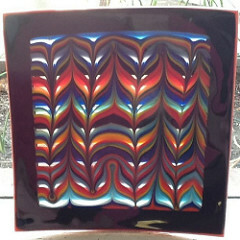 I work with stained glass methods as well as fused and hot glass methods. My focus is to make this world a much more beautiful place than how I found it by way of creating works of art from glass. I am not ever bound to traditional methods but also am intrigued to combine many techniques into any one project. My works are national as well as residing in international locations.